Well, it wasn’t pretty, but I did it. And I take back everything I said about Mother Nature – she was awfully good to me Saturday morning. In fact, it was so beautiful out that before the race even started, I had already shed 2 of the 4 layers I was wearing and I ended up shedding that third layer 1/4 of the way through the race. Shawn and the kids came out to cheer me on, which was really nice. I’m glad they were there because my 2 friends who were supposed to run with me both had to cancel. It would have been a lonely day if my little family hadn’t been there. So we start the race and I’m doing okay for about the first half mile then I begin to struggle. This race was an out-and-back and what I didn’t realize until later was that the first part of the race was on a slight incline most of the way. It was tough. Then about halfway through, my right food started to go numb. Then the middle toes on my left foot started to ache along with my arch. I thought that maybe my shoes were tied too tight, so I stopped for a moment to retie, but that didn’t really help at all. Pretty soon my whole right foot was completely numb, but since I couldn’t feel anything it also didn’t hurt anymore. I don’t know if it’s my shoes or my weight, or a combination of both, but I don’t want to go through that hell again. I ended up walking quite a bit more than I had intended. I just didn’t have it in me to run as much as I wanted to – guess I’ll have to keep working on that. 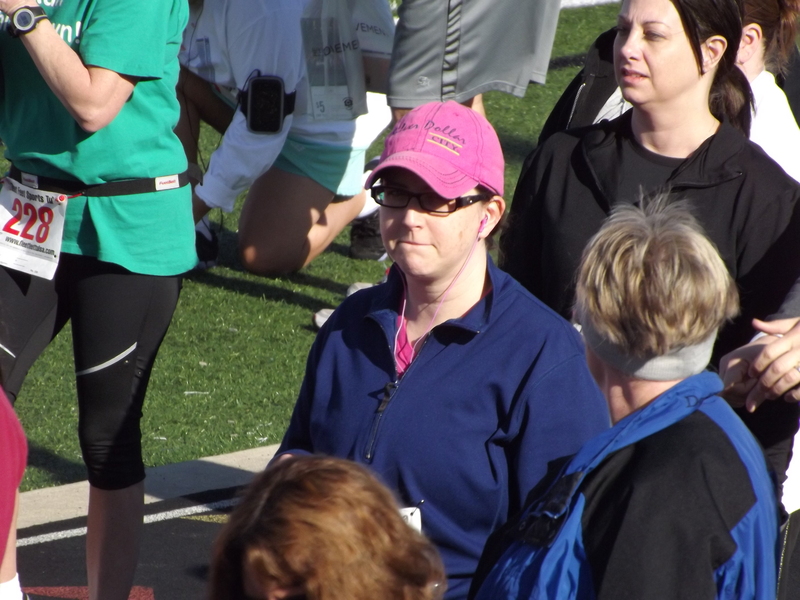 I did run the last half mile – very slowly, but I knew the finish line was coming so I just hung in there as much as I could. I'm smiling because I can see the finish line. I crossed the finish line at 44:23. I figured it would probably take me about 45 minutes, so I was right on. 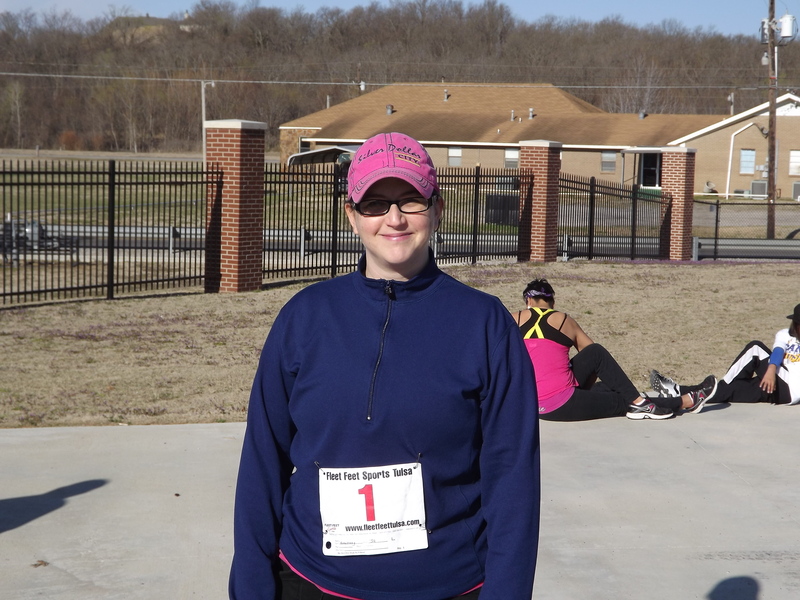 However, 2 years and 25 pounds ago, I ran a 5k in 36:21 (and I had hardly trained for that race), so you can see what a big difference all that weight makes. I really want to run faster, which means I really need to lose weight and train outside more often than I have been. After my race, we went home and showered and headed over to my mom’s house to have my birthday with my sisters and their families. I got a Coach purse from one sister (yay!!) and the coolest necklace from my other sister – it’s a necklace made from a 1933 typewriter key with my initial “J” on it. Mom gave me a gift card which I am going to use next weekend. I love birthdays!! It’s still a good time, you finished and you have a goal for next time! Congratulations on finishing, especially when you ended up having to run without your friends. 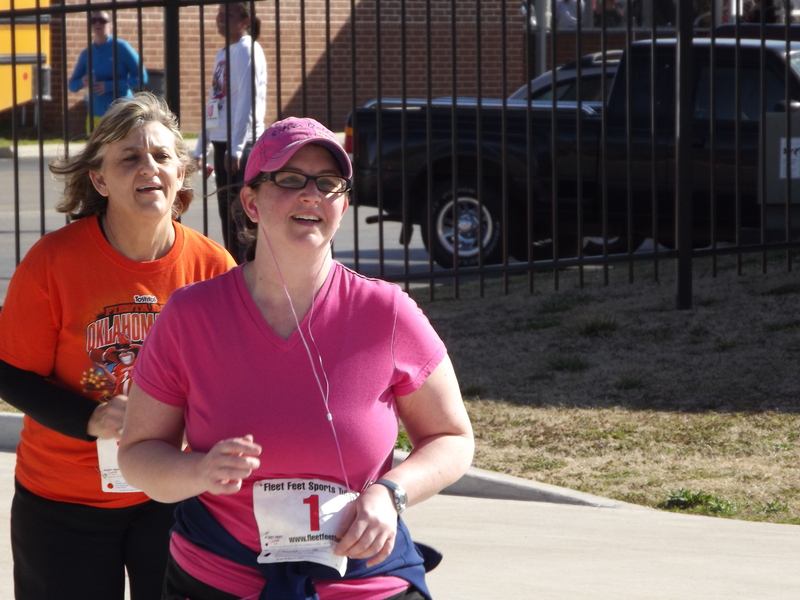 I much prefer having someone to run with, and the races that I don’t, well, it’s not pretty. As for your foot, I wonder if you might need different shoes – have you been to a running store lately? Sounds like a great birthday overall! I actually did get these shoes from a running store a couple of weeks ago – I got fitted and everything so I’m not sure why I had such trouble. I may call the running store today to see if they have any suggestions – luckily they have a 90 day fit guarantee, so if I need to exchange them they’ll let me. Thanks, I will definitely try that. I’m interested to see what runners say about the numb foot. When I first started walking longer distances, I had a terrible problem with my foot going numb. One more than the other. It hasn’t happened for a long time, so I just thought it was ‘conditioning,’ or my foot getting used to the walking. I would question the shoe a bit – fit, laced, etc. You’re going to need to dig more into that, and check out how you’re feeling today. Which aches and pains you have that would be expected, and where others are that are not. feet going numb is not a good thing. And I love the idea of the “J” necklace!! I wonder if there is a version for guys like a keychain or something. Danny also writes for the county newspaper. That would make a cool gift. Fantastic job, you made it!